Grant, we pray, almighty God, that no tempests may disturb us, for you have set us fast on the rock of the Apostle Peter's confession of faith. Through our Lord Jesus Christ, your Son, who lives and reigns with you in the unity of the Holy Spirit, one God, for ever and ever. This feast brings to mind the mission of teacher and pastor conferred by Christ on Peter, and continued in an unbroken line down to the present Pope. We celebrate the unity of the Church, founded upon the Apostle, and renew our assent to the Magisterium of the Roman Pontiff, extended both to truths which are solemnly defined ex cathedra, and to all the acts of the ordinary Magisterium. Since early times, the Roman Church has had a special commemoration of the primatial authority of St. Peter. As witness one of the most renowned of the Apostolic Fathers, the Roman See has always held a peculiar place in the affection and obedience of orthodox believers because of its "presiding in love" and service over all the Churches of God. "We shall find in the Gospel that Jesus Christ, willing to begin the mystery of unity in His Church, among all His disciples chose twelve; but that, willing to consummate the mystery of unity in the same Church, among the twelve He chose one. He called His disciples, said the Gospel; here are all; and among them He chose twelve. Here is the first separation, and the Apostles chosen. And these are the names of the twelve Apostles: the first, Simon, who is called Peter. [Mt. 10, 1-2] Here, in a second separation, St. Peter is set at the head, and called for that reason by the name of Peter, 'which Jesus Christ,' says St. Mark, 'had given him,' in order to prepare, as you will see, the work which He was proposing to raise all His building on that stone. "All this is yet but a beginning of the mystery of unity. Jesus Christ, in beginning it, still spoke to many: Go, preach; I send you [see Mt. 28, 19]. Now, when He would put the last hand to the mystery of unity, He speaks no longer to many: He marks out Peter personally, and by the new name which He has given him. It is One who speaks to one: Jesus Christ the Son of God to Simon son of Jonas; Jesus Christ, who is the true Stone, strong of Himself, to Simon, who is only the stone by the strength which Jesus Christ imparts to him. It is to him that Christ speaks, and in speaking acts on him, and stamps upon him His own immovableness. And I, He says, say to you, you are Peter; and, He adds, upon this rock I will build my Church, and, He concludes, the gates of hell shall not prevail against it. [Mt. 16, 18] To prepare him for that honor Jesus Christ, who knows that faith in Himself is the foundation of His Church, inspires Peter with a faith worthy to be the foundation of that admirable building. You are the Christ, the Son of the living God. [Mt. 16, 16] By that bold preaching of the faith he draws to himself the inviolable promise which makes him the foundation of the Church. "It was, then, clearly the design of Jesus Christ to put first in one alone, what afterwards He meant to put in several; but the sequence does not reverse the beginning, nor the first lose his place. That first word, Whatsoever you shall bind, said to one alone, has already ranged under his power each one of those to whom shall be said, Whatsoever you shall remit; for the promises of Jesus Christ, as well as His gift, are without repentance; and what is once given indefinitely and universally is irrevocable. Besides, that power given to several carries its restriction in its division, while power given to one alone, and over all, and without exception, carries with it plenitude, and, not having to be divided with any other, it has no bounds save those which its terms convey." Excerpted from The See of St. Peter, Jacques Bossuet. 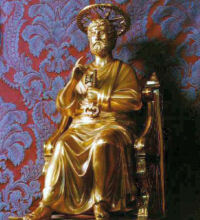 Read what the Catholic Encyclopedia says about the Chair of St. Peter. View some photographs of the Chair of St. Peter.